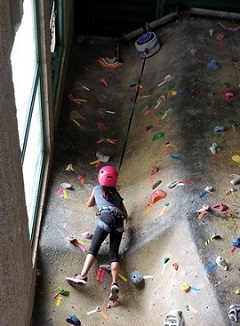 A Climbing instructor will supervise climbing for your child's birthday. After 1.5 hours of rock climbing, there will be a half hour of parent-led time for cake, pizza, ice cream, and opening presents. Parents provide the food and presents. The cost is $120 for rental of the Gym (includes one staff member). Parties of 16 or more need an additional staff person for $25. For ages 5 years old and up. A $25 deposit is required. More details are available at the Member Services Desk. A Birthday Party Request form must be completed and submitted to Sports & Adventure Director no less that 2 weeks prior to party preference date. Party confirmation must be received before Party Reservation can be made. An instructor will organize athletic games including basketball, volleyball, floor hockey, soccer, or kickball for your child's birthday. After 1.5 hours of games, there will be a half hour of parent-led time for cake, pizza, ice cream, and presents. Parents provide the food and presents. The cost is $90 for rental of the Gym (includes one staff member). Parties of 16 or more need an additional staff person for $25. For ages 4 years old and up. A $25 deposit is required. More details are available at the Member Services Desk. A Birthday Party Request form must be completed and submitted to Sports & Adventure Director no less that 2 weeks prior to party preference date. Party confirmation must be received before Party Reservation can be made.